So as the title suggests, I need to make a load-balanced internal gateway with a VPN. I'm a developer, so networking is not my forte. I have two identical VMs (VM1 in Availability Zone 1 and VM2 in Availability Zone 2) and I need to share VPN traffic between them. My client has provided a range of 5 addresses that will be configured on their firewall, so I will pick one for them to use and they then need to be oblivious to the internal routing. My ultimate goal is to allow the client to connect through a VPN to one IP address (in the range they have allocated) and let Azure direct the traffic to VM1 primarily, but failover to VM2 if Availability Zone 1 goes down. The client must be oblivious to which VM they ultimately connect to. My problem is that I cannot create a configuration where the Load Balancer's static IP is in the address range of the Gateway's VPN P2S address pool. Azure requires the P2S address pool to be outside of the VNet's address space and the Load Balancer needs to use the VNet's Subnet (which obviously is INSIDE the VNet's address space, so I'm stuck. I can create the GW -> Vnet -> subnet -> VM1/VM2 set up no problem using the client's specified IP range for the P2S VPN, but without a Load Balancer, how do I then direct the traffic between the VMs? I can create a Load Balancer to use the Vnet (and the VMs in a Backend Pool), but then it's static IP has to fall in the VNet's subnet and thus outside the P2S address pool. So how do I achieve this? Firstly, the Azure load balancer does round-robin load balancing for new incoming TCP connections, you could not use it for failover. My problem is that I cannot create a configuration where the Load Balancer's static IP is in the address range of the Gateway's VPN P2S address pool. 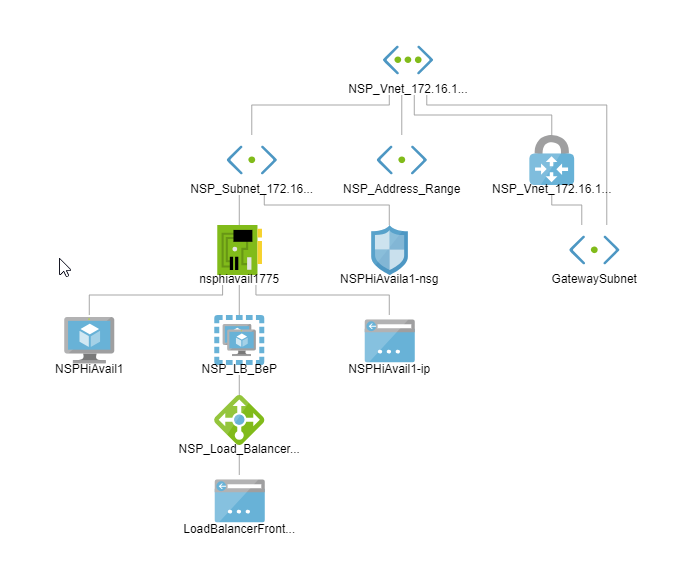 You do not need to add the Load balancer frontend IP in the P2S address pool, the address pool is used for clients connecting to your Azure VNet. Generally, you could configure P2S VPN gateway, create Gateway subnet and vmsubnet and create an internal standard SKU load balancer in the vmsubnet, then you could add the VMs in the vmsubnet into the backend pool as the backend target of the load balancer and configure the healthpro and load balancer rule for load balancing traffic. If so, you could access the backend VMs from clients via the load balancer frontend private IP. Moreover, you could know some limitations about internal load balancer. Azure Virtual Machine Scale Sets implement as many VMs as I specify and will automatically switch to another zone if one goes down. I have no need for the scalability aspect, so I disabled this and I'm only using the Load balancing aspect. The cost is exactly what you'd pay for individual VMs, but the loadbalancing is included. So it's cheaper than the solution I described in my question. Bonus! Not the answer you're looking for? Browse other questions tagged azure azure-virtual-network azure-load-balancer or ask your own question.